Horses of the Dawn is a great book series about horses. Estrella was born on a ship sailed by Spanish conquistadors. She's always been a sling, and she's never seen sunlight. Then the conquistadors decide the horses make the ship too heavy, and so they throw Estrella, her mother, and other horses off the boat into the water. The horses make it to shore somewhere in Central America. This is amazing. It's very inspiring and the horses are interesting. It's very different from all other horse books I've ever read. You should read the series! I liked the Hoofbeat Quests WAY better. 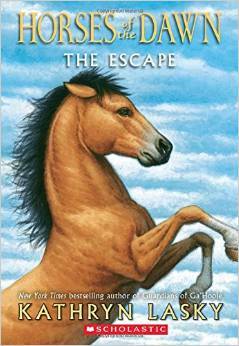 The Escape by Kathryn Lasky is about a foal named Estrella who is born in the middle of the ocean on a boat. The gold-seeking men aboard decide that the horses are too heavy and throw them off the boat. Can Estrella guide her herd through a new land?